A Combined Task Force (CTF) 150 and CTF 151 delegation, led by Commodore Daryl Bates Royal Australian Navy, recently met with senior maritime leaders in Djibouti. The joint CTF 150/151 delegation met the Chief of the Djibouti Navy, Colonel Abdourahman Aden Cher and the Commandant of the Djibouti Coast Guard, Lieutenant Colonel Wais Omar Bogoreh. Djibouti occupies a strategic geographical position bordering the Gulf of Aden and the Bab al-Mandeb Strait, a saltwater highway for the movement of thousands of merchant vessels passaging the Red Sea. Currently, about 50 large merchant ships, carrying 3.4 million barrels of oil, transit the strait every day as they travel between the Mediterranean Sea and the Indian Ocean and Middle East regions. 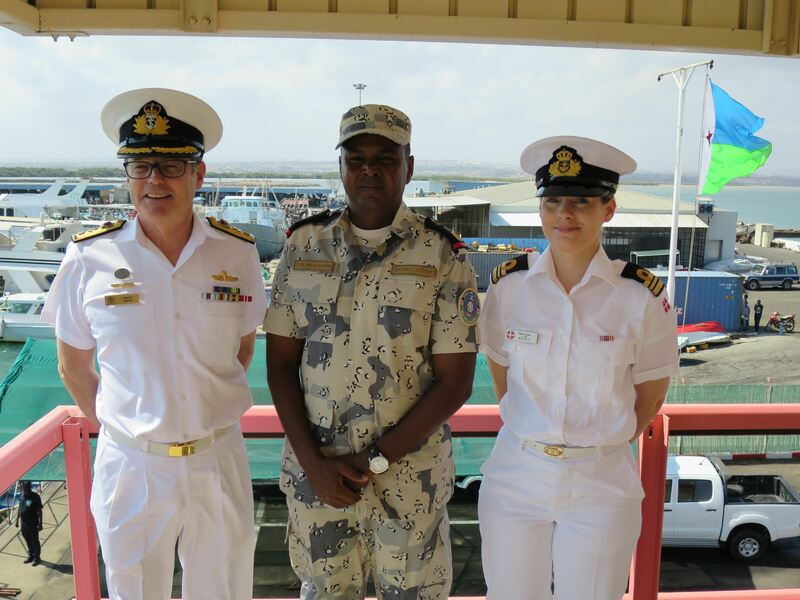 Commander Combined Task Force 150, Commodore Daryl Bates, Royal Australian Navy, Chief of the Djibouti Navy, Colonel Abdourahman Aden Cher and Regional Engagement Officer Combined Task Force 151, Lieutenant Commander Maria Vang Knudsen, Royal Danish Navy meet in Djibouti. In discussion with representatives from the Djiboutian Navy, participants highlighted the national and international economic dependence on maritime security. 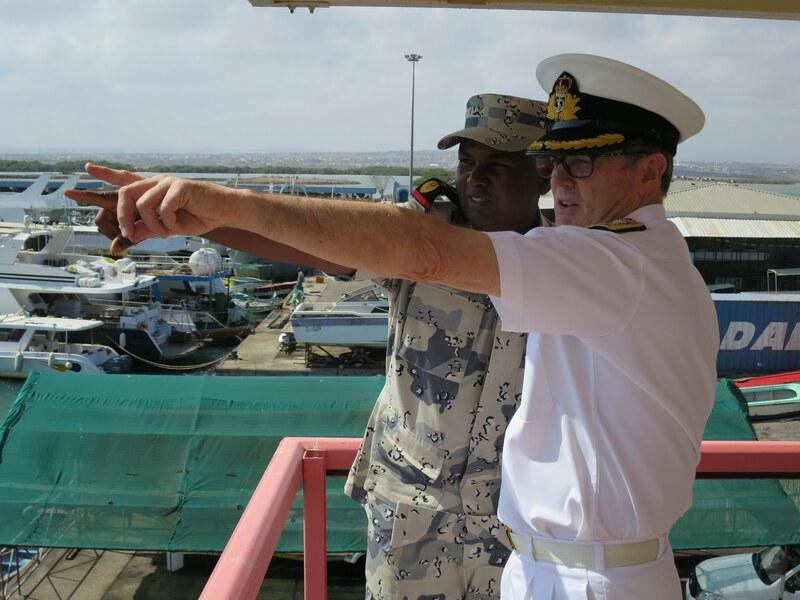 Commodore Bates, Commander of CTF 150 said: “Without safe sea lanes and secure ports, the economic impact to Djibouti and all countries that rely on the use of her port, or navigate through the adjacent waters would be compromised. “Our meetings with the Djiboutian Navy and Coast Guard has reaffirmed that our work in the CMF is complementary to that of our regional partners. Djibouti is concerned with the same threats that we are working hard to suppress. “Despite being a relatively small country, both in size and population, Djibouti is demonstrating that you don’t have to be big to have a very real impact on maritime security. The extraordinary growth of their Coast Guard, planned over the next two years, is testament to Djibouti’s commitment to maintaining a lawful and stable maritime environment, free from criminal activity and the threat of terrorism. 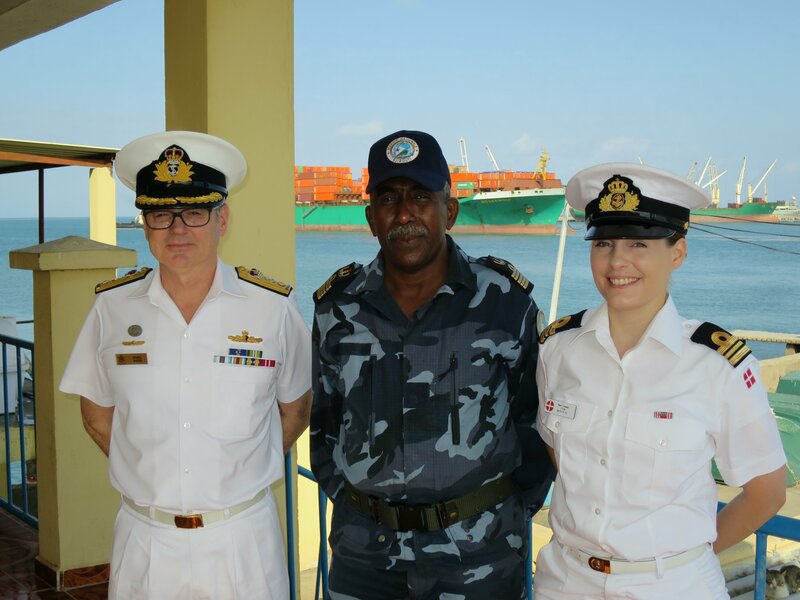 Commander Combined Task Force 150, Commodore Daryl Bates, Royal Australian Navy, and Commandant of the Djibouti Coast Guard, Lieutenant Colonel Wais Omar Bogoreh discuss maritime security in Djibouti. While in Djibouti, CTF 150 and 151 representatives took the opportunity to meet with the Deputy Commander of the Combined Joint Task Force – Horn of Africa, Brigadier General Scott Smith, and Commander of the French Forces Djibouti, Brigadier General Joel Rode, to share perspectives on the regional security climate, acknowledging that security efforts need to be coordinated across air, maritime and land borders. Commander Combined Task Force 150, Commodore Daryl Bates, Royal Australian Navy, Commandant of the Djibouti Coast Guard, Lieutenant Colonel Wais Omar Bogoreh and Regional Engagement Officer Combined Task Force 151, Lieutenant Commander Maria Vang Knudsen, Royal Danish Navy meet in Djibouti. CTF 151 is commanded by Commodore Aage Buur Jensen of the Royal Danish Navy with a headquarters staff including personnel from Denmark, New Zealand, South Korea, Japan and Saudi Arabia. It’s principal mission is to disrupt piracy and armed robbery at sea and to engage with regional and other partners to build capacity and improve relevant capabilities in order to protect global maritime commerce and secure freedom of navigation. CTF 150 and CTF 151 are two of three task forces commanded by CMF, a multinational naval partnership of 29 nations, which exists to promote security, stability and prosperity across approximately 2.5 million square miles of international waters, which encompass some of the world’s most important shipping lanes.